See their cute photo during the boxing champion's visit in Manila. 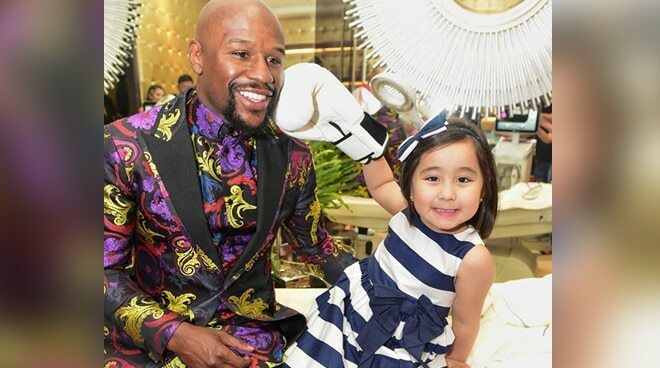 Floyd Mayweather Jr. could not help but be caught by the charm of celebrity kid Scarlet Snow Belo. The boxing champion gamely posed for an adorable photo with Scarlet who can be seen landing the boxing glove to his face in an Instagram post. "I'll get in trouble with Daddy for hitting a person, but Mr. @floydmayweather said if I do it gently it's okay. I will always remember that at four years old, I landed a punch on his cute face," Scarlet posted on Tuesday, April 2. Floyd is currently in the Philippines for an endorsement shoot with a cosmetic dermatology brand in the country. He also visited Boracay prior to his endorsement commitment. This is the second time that the boxing champion visited the country.